My dad is an awesome cook and I have always loved simple vegetables cooked by him. 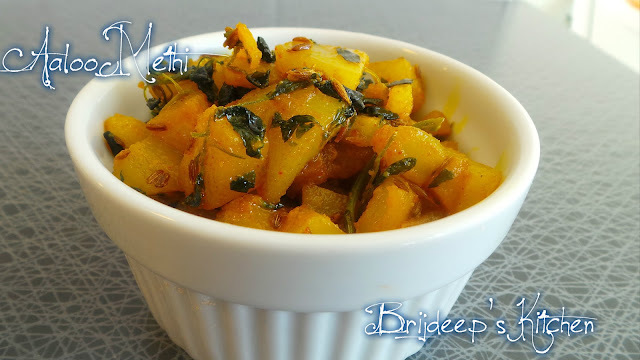 He used to prepare this very quick and simple aaloo methi subzi back home and it was never enough for me and I used to simply relish it. But after I moved out of India, I had a hard time finding methi (fenugreek) leaves and so I used to feel something is missing. 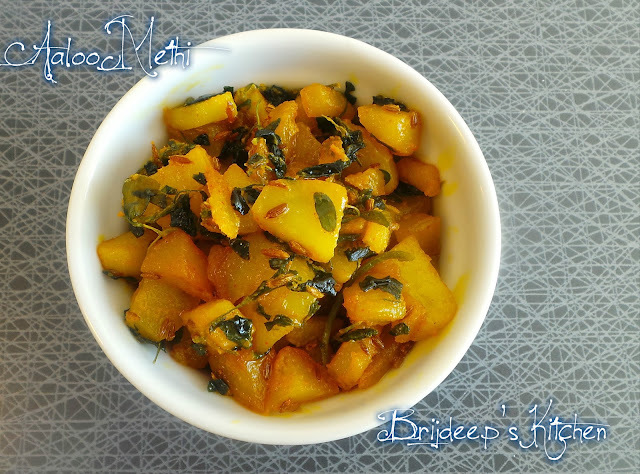 But then I decided to grow my own methi and use those leaves to satisfy my craving by preparing this vegetable. 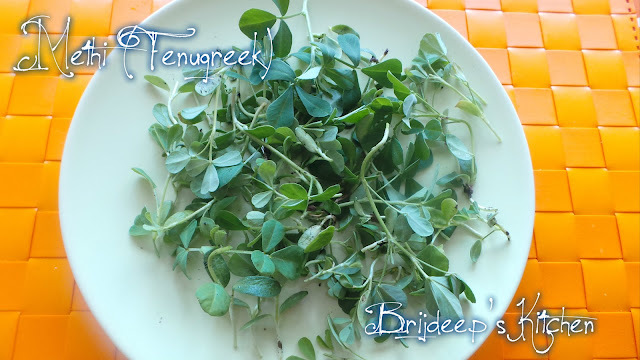 Take a few fenugreek seeds used in Indian households as a spice and wash and soak overnight (at least 10 hours). 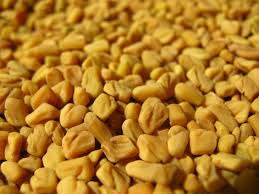 This is fenugreek seeds. Drain the water (you can drink this water, it's very good for digestive issues; or simply throw away) and keep the methi seeds for sprouting. I used my sprouts maker for the same: just filling the water in the lower portion and spread the soaked seeds on the tray and cover. You will see the seeds have started to sprout after about 18-20 hours. This also depends upon the temperature. The seeds will sprout faster in warm weather and slower in cold weather. You can also sprout the seeds in the traditional way of hanging the seeds in muslin cloth. Take a good quality potting soil and fill the pot in which you are planting the seeds, about more than half with soil. Sprinkle the seeds evenly in the soil and then just sprinkle a little soil. This does not need to be covered completely. Sprinkle some water and leave for about 12 hours. After 12 hours, water the seeds (not too much, just so as the whole soil is wet). Keep in sunshine and sprinkle water everyday. Do not let the soil become very dry. In 3-4 days you will see little leaves coming out from the soil. Keep watering and the leaves will grow completely in about 4-5 weeks. My leaves took exactly 34 days. Using a sharp scissors, cut the leaves along with tender stems and leave the roots portion in the soil as it will grow back and will yield more leaves. Wash thoroughly and now the methi is ready to be cooked. Heat oil in a pan and add cumin seeds when hot. Add very finely cubed potatoes to the pan after the cumin seeds splutter. Add salt and turmeric powder. Mix well and let it cook until the potatoes are 3/4th cooked. Add chopped fenugreek leaves and mix well. Add red chilli powder and mix well, cook until the fenugreek leaves are cooked and they wilt. Add the milk/cream to the pan. Mix very well. Let it cook for about 10 minutes on a low flame. The milk/cream will be absorbed by the vegetable. Keep stirring so that it does not stick on the pan. The end result must be in almost a dry form, not watery. Serve hot with rotis/parathas and raita. It can be used as a side dish with another main course vegetables.